Round 15 of the 2019 Monster Energy Supercross, an FIM World Championship series, and round 9 of the Western Regional 250SX Championship landed in the Mile High City for the 2019 Denver SX. The day started out with qualifying in the snow, but the sun came out and made for some great racing when the lights came on. In the 450SX class main event, Monster Energy / Kawasaki’s Eli Tomac won his second main event in a row, with the Red Bull / KTM duo of Cooper Webb and Marvin Musquin occupying the final two spots on the podium. The win by Tomac only shaved three points off of Webb’s stranglehold on the points, leaving the #3 with an 18 point mountain to climb with just two main events left in ’19. In the penultimate round for the 250SX West—only the Las Vegas East/West race remains for them—Monster Energy / Pro Circuit / Kawasaki’s Adam Cianciarulo ran away with a dominant win after two straight wins by Monster Energy / Yamaha’s Dylan Ferrandis cut his lead to just five points. AC stretched his lead to 8 points with the Star Racing duo of Ferrandis and Colt Nichols finishing in 2nd and 3rd. 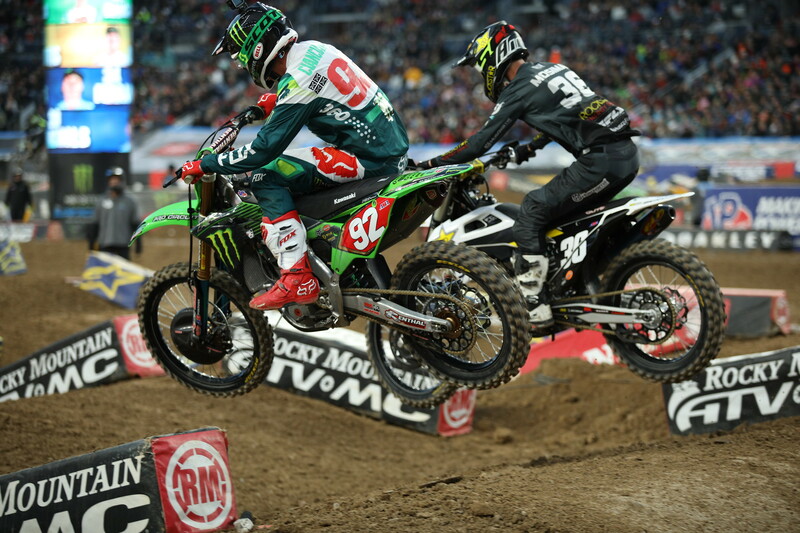 Cianciarulo (92) passed Mosiman (36) and ran away for the win. 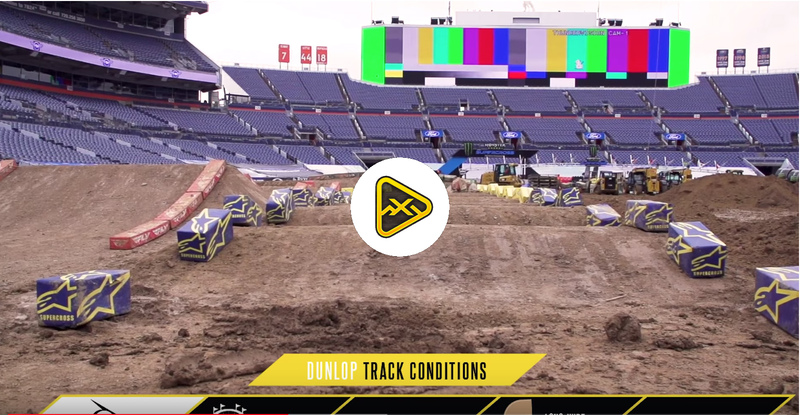 After the racing in Denver was over, we gathered some quotes from the riders. 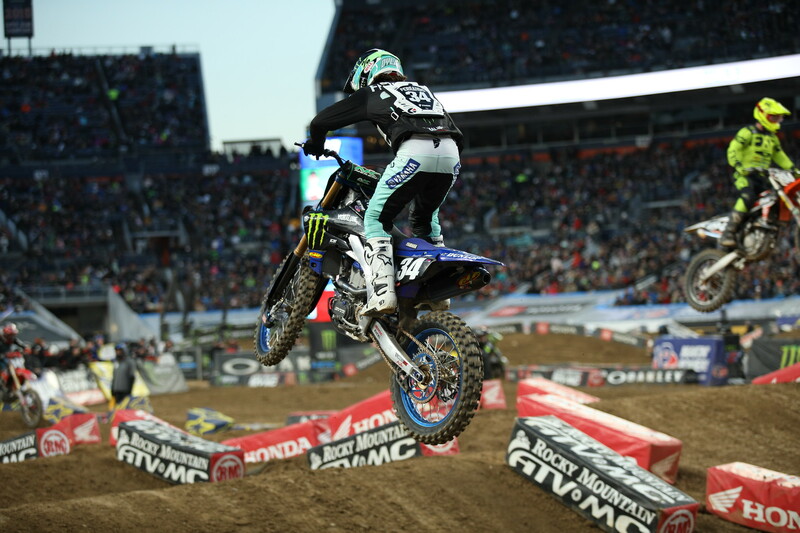 Check out some post-race quotes from the Denver SX below. 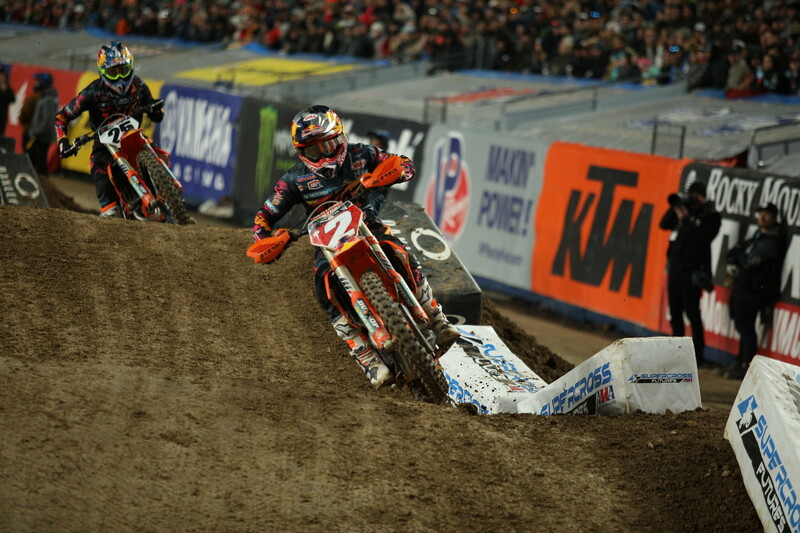 Webb (2) dug deep to pass his teammate Musquin (25) late in the main and score 23 vital Championship points. While Dylan is 8 points back, anything can (and often does) happen at the Las Vegas East / West final.